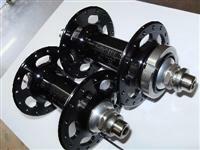 Description: Available as a fixed/free flip-flop or single sided fixed, the High Flange Rear is one very burly hub. 65mm flanges provide stiffness and precision cut windows save weight. lock ring included.